The following eight tips will help ensure you get started correctly on the path of finding your ancestors. Early on in my professional genealogy career I was contacted by a client who had already started on his research but wanted my help to go further. As always, I checked the information he had so far and came across an anomaly. The client had naturally assumed that the family members he knew were who they should be, but this was not the case. I found that his grandparents were actually his maternal great grandparents, and his father’s aunt was actually his grandmother. This aunt was the eldest of several children and had an illegitimate son who was only a couple of years younger than his mother’s youngest sibling. 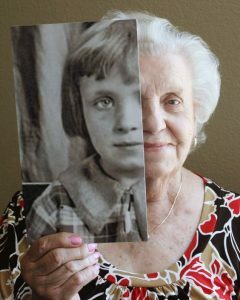 It seems that his grandparents had brought him up as theirs and he was not aware that his sister was really his mother. Although in this case the same family lines were involved, it is possible that the child could have been informally adopted by a different family altogether. NEVER assume anything about relationships. Always check them first. the eldest who knows the family stories/secrets. My uncle is almost 10 years younger than my mother, but as the youngest he spent more time with his mother after his older siblings had flown the nest. He therefore heard stories that my mother, as the eldest, did not know about. It is always worthwhile asking other relatives about your family history. Sometimes aunts, uncles, and even cousins know more about your family than you do. They may also hold treasures from previous generations. I have even known family friends to have answers that the family did not. Plus it is important to understand and learn from different perspectives. 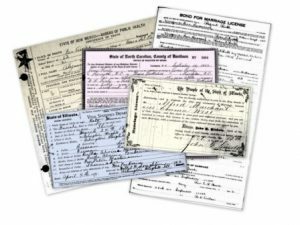 Buying certificates of vital records can be very expensive. In England and Wales each certificate cost just under £10 each. Assuming that the person only married once, they will have three certificates each. If you only buy certificates for the head of each family, it would cost almost £90 (about $110 USD) for just three generations. Learn what type of information is recorded on the certificates and decide if you really need to buy it. The General Records Office (GRO) website gives details of what is recorded and shows examples of each certificate. If you do need to buy a certificate for a vital event, only buy them from official websites. In England and Wales there are only two places where certificates can be purchased – the Local Registrar’s Office and the GRO. 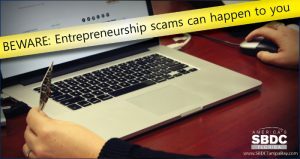 There are a few unscrupulous websites that will charge you much more, even though they can only purchase the genuine certificates from the same places as you can. One site even suggests they are the official place to order UK records. If in doubt, ask Genealogists.com, the world’s largest family history research firm. 4. Use caution with FREE websites. Many family history researchers tend to spend lots of money on one or two subscription genealogy websites. Although they undoubtedly do have lots of useful information, you may not need to buy a subscription. Look out for free trials or free weekend access. The later only requires free registration to the site while the former will ask you for your credit card details. Make sure you cancel free trials before they automatically take payment for a full subscription (you should still have free access until the end of the trial regardless of when you cancel it.) Registration is required for both, but this is free and you can choose not to receive emails from them. Check to see which genealogy websites are available in libraries and archive offices. In the UK, we often get free worldwide access to Ancestry in our libraries. There are several free to use genealogy websites in the UK that cover the GRO indexes, parish registers, census returns, trade directories, and much more. Some of these have been set up by not-for-profit organisations, some by family history societies, and others by county archive offices. It is very easy to find a family tree created by someone else whether it is a relative or an online tree. NEVER assume the tree is correct. 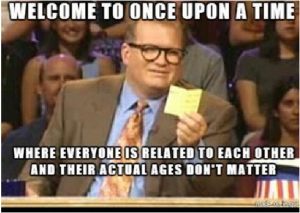 Sadly many people create family trees without checking the evidence. I have seen online trees that show people getting married several years after their death, and one even before she were born! If they can get the basic information wrong, can you be sure the family members are correct? You can use them as a guide, but ALWAYS double check the information from an independent source. 6. Know that not everything is online. 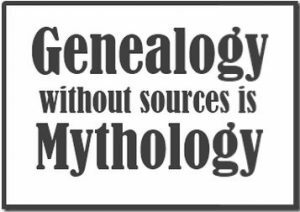 This mo st common problem I come across is because people believe that everything is online; therefore, if they can only find one record for their ancestor, even though it does not quite fit, then it must be correct. This is simply not true. 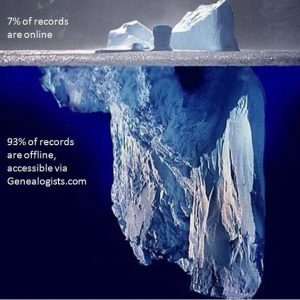 Genealogy record access is like an iceberg – only the tip is online, the rest is available in a variety of archive repositories around the world. At some point in your research you will have to either visit a relevant archive office or pay a professional research firm to do the research on your behalf, such as Genealogists.com, whose genealogists are members of professional genealogy associations such as the Register of Qualified Genealogists (RQG), Association of Professional Genealogists (APG), and Association of Genealogists and Researchers in Archives (AGRA). 7. R ecord your findings. Apart from checking your evidence, the second most important part of any research is to record every detail of WHAT you have found and WHERE you found it. Always record everything in the document as you will never know if it will prove to be important later on. Inexperienced researchers often do not record the witnesses at weddings or on birth and death certificates, but they could be family members – perhaps married sisters or cousins. To avoid many of the pitfalls, take time to learn about your new hobby. It is not always as easy as you think it will be. Reading blogs such as this one is a good way to start. You could also buy a book, attend a family history class, or do an online course. Enjoy your research. 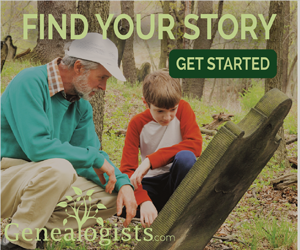 Genealogy is a hobby that can last a lifetime, and the information can be handed down to the next generations. Anne Sherman is a genealogist with Genealogists.com and a member of the Association of Professional Genealogists (APG) and the Register of Qualified Genealogists (RQG) having completed a 2 year Postgraduate Diploma in Genealogical, Palaeographic and Heraldic Studies with Strathclyde University. Anne has conducted research for the Who Do You Think You Are? Television program and recently had an article published in the Your Family History magazine.